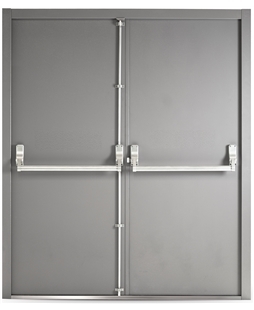 Our heavy-duty Steel Security Doors make perfect back doors to any commercial or industrial building, as they are some of the most secure doors on the market. Here at Value Doors UK, we have two different designs of steel doors that are available as a single or double door and offer more security than a uPVC or Composite Door. Steel Security Doors This door has been specifically created to stop any unwanted guests entering a building. With a multi-point drill, an impact proof locking system and a 50mm thick door that has 2 steel strengthening structural supports running through it, these High Security Steel Doors are a great solution if you are concerned about the security of your commercial property. 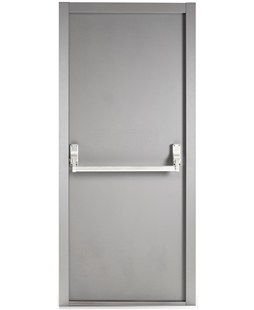 Fire Exit Doors If you need an incredible strong door that can also be used as an Exit Door in the case of a fire, then you need one of our Steel Fire Exit Doors. These doors incorporate the same features as our steel security doors, but with the added bonus of a crash bar, which makes the back door extremely easy to open. Please Note: Every Composite, uPVC or steel door you view on our website can be installed as a back door. However, some may be more suitable than others, considering the slightly different requirements you may have for your rear entrance. Book your survey for free today!